The Regina Pats (8-20-0-0) kick off a three-game road trip in the Central Division on Wednesday night against the Edmonton Oil Kings (14-11-3-2). Puck drop is at 8:00 p.m. Regina time at Rogers Place. The Pats are coming off a 3-2 loss on home ice on Sunday at the hands of the Medicine Hat Tigers, their fifth straight defeat. The Oil Kings were last in action on Saturday when they lost a fifth straight game, 4-3 in overtime on the road against the Calgary Hitmen. 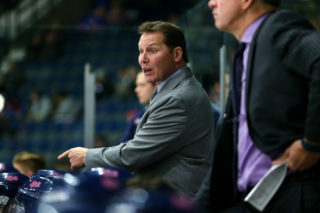 Tonight is the second of four meetings between Regina and Edmonton, the Pats are 0-1-0-0 so far in the season series. Tonight’s game can be heard with Bennett Dunlop Ford Pats Hockey starting at 7:35 p.m. on 620 CKRM. The Medicine Hat Tigers earned a come from behind 3-2 win over the Regina Pats on Sunday at the Brandt Centre. The Pats got off to a good start when Sergei Alkhimov scored the teddy bear toss goal at 6:28, his fifth of the year and Regina led 1-0. 50 seconds later, Austin Pratt buried a rebound for his 11th and the Pats led 2-0 after one. After a scoreless second, the Pats took the two-goal lead into the third. The Tigers started the comeback early with a goal from Bryan Lockner, 1:19 in. Josh Williams tied it for the visitors at 7:13, assisted by Cole Sillinger, the son of Pats great Mike Sillinger. It stayed 2-2 until late when James Hamblin finished off an odd-man rush for Medicine Hat to make it 3-2 and that was the final score. The Pats were outshot 41-32, the powerplay was oh for four, the penalty kill five for five and Max Paddock made 38 saves to earn second star honours. 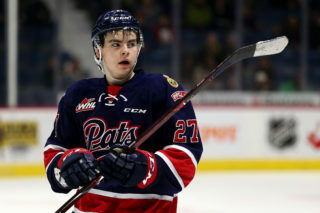 Pats rookie forward Sergei Alkhimov snapped a 12-game goalless drought on Sunday afternoon with the teddy bear toss goal against the Medicine Hat Tigers. The 17-year-old finished off a beauty feed in front from Cole Dubinsky to give the Pats a 1-0 lead in the opening period. 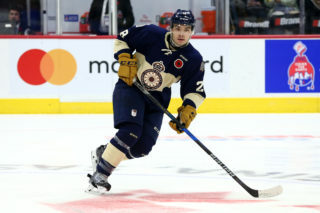 Alkhimov, drafted in the first round of the 2018 CHL Import Draft, has five goals and 10 points through 27 games this year. He has three powerplay points, one goal and two assists and is tied for the lead among all WHL rookies with one shorthanded goal. A product of Moscow, Russia, Alkhimov’s 10 points are tied for 23rd among rookies in the league and his five goals are tied for 12th. Since trading top scorers Nick Henry, Jake Leschyshyn and Aaron Hyman last week, the Pats have gotten some offensive contributions from first year players in the last three games. The aforementioned Sergei Alkhimov has a goal, as does Carter Massier, his first in the WHL. Ryker Evans has two assists, while Garrett Wright, Cole Dubinsky, Marco Creta and Nikita Sedov all have one helper in their last three. For the season, the Pats have 17 goals and 33 points from rookies in 28 games. 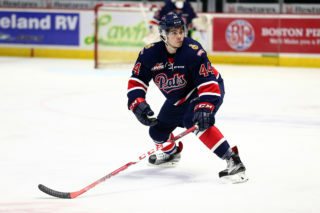 Pats forward Jadon Joseph is filling in well in the faceoff circle as the club’s top line centerman. 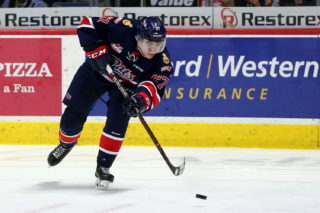 The 19-year-old has gone 63.1 per cent in the draws in three games with Regina, winning 41 of 65. For the season, Joseph is 54.1 per cent in the faceoff circle, going 280 for 518. That mark is tied for 15th among players who have taken at least 200 draws.